Property settlement negotiations usually play a large part in most divorces and while Florida’s requirement that property agreements be fair and equitable may seem relatively straightforward, this not always true. For instance, most people assume that equitable means equal, but when it comes to property settlements, assets are rarely divided 50/50. For help coming to a fair and equitable property settlement agreement with your own spouse, please contact a property division attorney who can assist you. 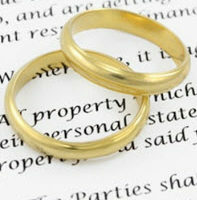 Whether either spouse deliberately wasted assets in an effort to deprive the other party of enjoying them. While all of these factors do play a role in a court’s determination of what type of property agreement would be fair, it’s important to keep in mind that most courts won’t even need to address these factors if a couple is able to come to an agreement on their own. Generally, courts only intervene if the spouses are unable to reach an agreement in an out-of-court setting, or if it is clear that the agreement that was reached is unfair to one spouse. When Does This Standard Apply? Court judgements, settlements, and jury awards recovered during the marriage, but only if the lawsuit was filed in one spouse’s name. Courts may also take each party’s separate assets into account when determining what would represent a fair and equitable division of marital property in a particular case. For help with your own property settlement-related questions and concerns, please call dedicated property division lawyer Sandra Bonfiglio, P.A. in Fort Lauderdale today. You can reach a member of our legal team at 954-945-7591 or via online message.